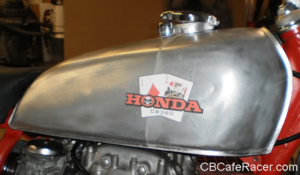 I found an old header on eBay but it turned out to be for a CB350. 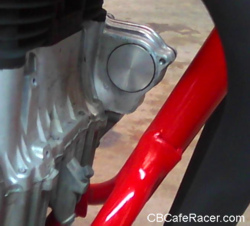 (The footpegs in the photo were going to be used for rearsets but later discarded.) 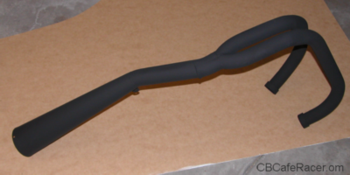 I was able to sandblast off years of deep rust, then got a local muffler shop to bend it to fit. It sounds great. The horn was originally located beneath the gas tank. It looked ugly but I couldn't toss it away because a horn is essential when that soccer mom or texting teen cuts you off in traffic. 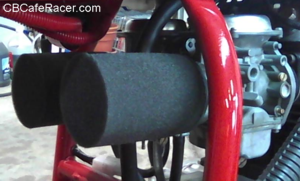 I found a new and louder horn, then made a bracket beneath the instrument cluster which hid it behind the headlight. With the starter motor, sprocket and chain gone, I found an aluminum plug for the hole. 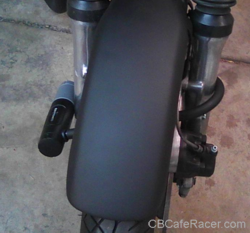 I bobbed the rear fender, then made a bracket to use the license plate to block off the open end of the fender, as well as hold a cats-eye taillight. 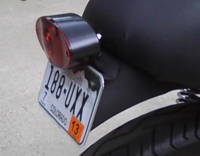 The light ended up being lower than I'd planned, so I had to cut a little crescent out of the top of the license plate. I don't think the cops will notice (or care). The fuel tank turned out pretty nice. I took off the Honda emblems and filled the indents. I painted it silver, then added the new graphics a friend made for me. However... the paint wasn't fuel-resistant and the first time I filled the tank, it streaked badly. I'm trying again, this time with an epoxy-type coat which should solve the problem. I'd love to chrome the tank but it's out of reach with my budget. 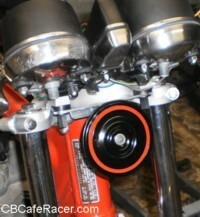 A pair of Uni pod filters look great but I'm told they don't flow any better than the stock Honda air boxes. Too late now. At first I used a pair of Emgo filters but didn't like them, partly because they look cheap. 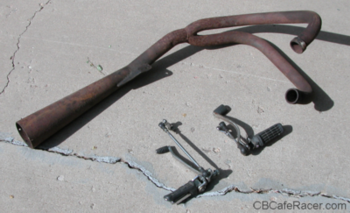 The original fork lock was removed which meant anyone could roll the bike away. I use a Kryptonite lock around the forks. It stows beneath the seat. It's the little things that round out a project.